NVC’s Project Joseph was envisioned to provide skilled persons with a single tool or piece of equipment that they need to jumpstart them into a better future for their families. 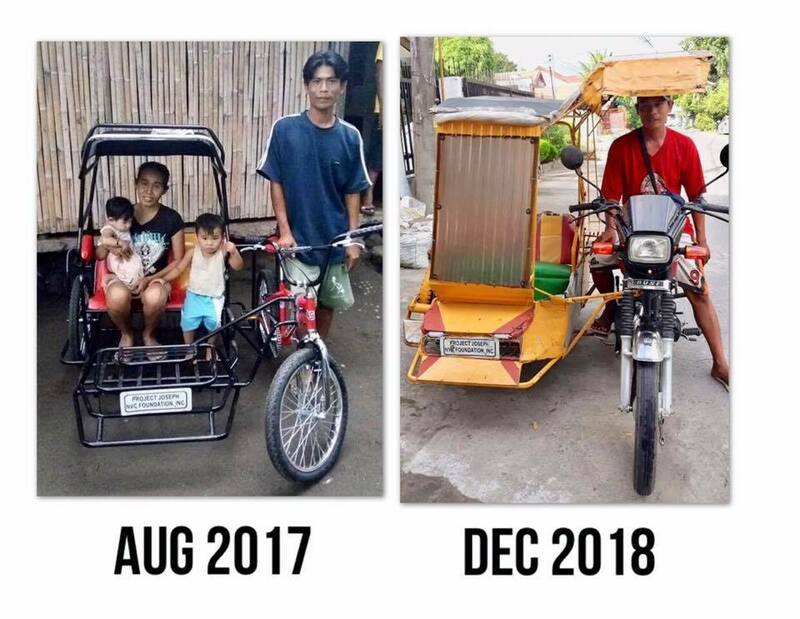 That’s how John Rell Flores began to earn better when he received his pedicab in August 2017 through the project. But John did something better. He would save a bit of his daily earnings until finally, in December 2018, he was able to buy a motorcycle–converting his pedicab into a a more powerful tricycle. Because he can’t afford a proper sidecar yet, he improvised his original cab to attach to his motorcycle. His clients don’t mind, as long as they get to their destinations. And John says, just watch out because now that he can go faster and and earn even more, a proper sidecar will soon be coming. Can you spot something that hasn’t changed? John has kept that little nameplate attached to the cab that says “PROJECT JOSEPH, NVC FOUNDATION.” It’s now a bit worn out and dented, but John says that’s how all this began, and he will never let go of that.